Metamorphosis 2 is a collection of imaginative & pop-surrealist figurative art, executed by some of the finest and most influential artists working today. 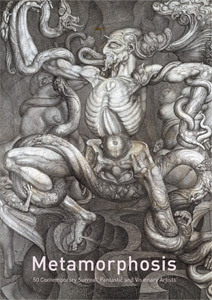 It features 50 contemporary artists, including HR Giger (right, front cover), Ron English, Robert Williams, Chris Mars, Lori Earley, Tiffany Bozic, Shawn Barber, David M. Bowers (left, back cover), Heidi Taillefer, David Stoupakis, Travis Louie, Greg 'Craola' Simkins, Michael Hussar, Paul Booth and many others. The Metamorphosis series provides exposure for artists who express themselves imaginatively with exceptional technique and uncompromised individuality. Metamorphosis showcases this ever- expanding international movement of figurative artists who have resisted current trends in the art world and remained true to their artistic vision. Metamorphosis 2 is a limited edition hard cover art book with 108 A4 pages and 122 plates.